How to stay chic in summer rainy days? To be honest, although we talk about the sun most often in the summer, sometime the rainy days are very bully, right? Rain can ease the summer heat, but it can also bring us some troubles, such as what clothes to wear to stay chic in the rain. No headache, because today I am going to provide some ideas for you! There is one important thing about rainy day outfit, that’s if you want to avoid the embarrassment of the clothes being wet by the rain and become see-through, please opt for the dark colors. This sundress is a nice rainy day outfit, the pockets are so intimate. Imagine a rainy day, we need to hold an umbrella, so it's not convenient to open the bag. It’s obviously that sundresses are not work-appropriate for some offices with strict requirements, no problem! You also can keep chic, black midi dress is very safe but maybe a little boring, hence we need some delicate details to make it looks more outstanding. Feminine lace can perfectly meet this requirement. If you are a girl who love enjoying interesting lives, then how experiencing dance in the rainy day. Rest assured, I'm not talking about dancing in the rain, but let the beautiful ruffles dance in the rain. Still don't understand? 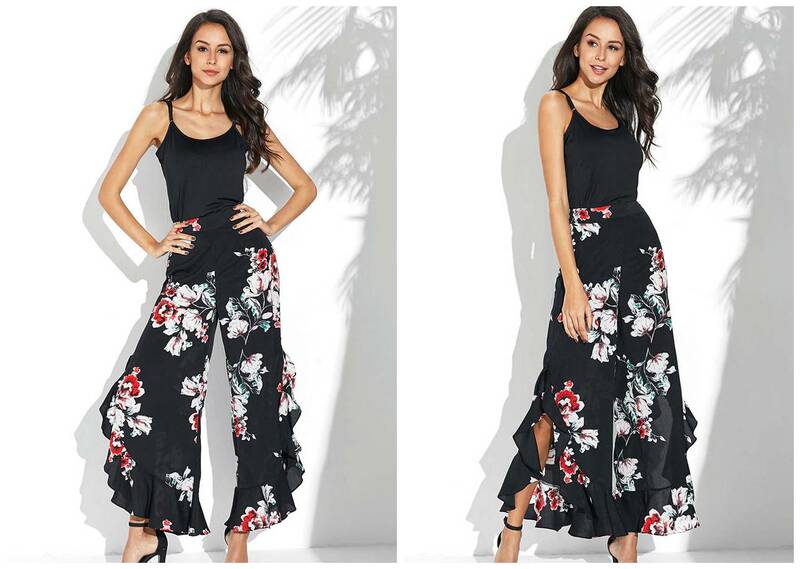 Look at these floral slit pants, then image that the hem will dance when you move! A simple way to add fun on a rainy day, isn't it? 下一篇： Occasion dresses are never enough!